This entry was posted in Birds, Journal, Nest and tagged bird eggs, maps, nature, nests, sketchbook, spring, watercolor sketch by Jean Mackay / Drawn In. Bookmark the permalink. Thanks so much Cheryl! I am loving our new home and I’m grateful to be here. It’s like living in a sanctuary! So much to learn, explore, and steward. Maine Audubon is a great place for classes. I don’t have anything scheduled at the moment but watch their program listing. Enjoy June! Wonderful perspective with the birds eye view. Beautiful art Jean. I like the idea of the birds eye view. Probably should have added a bird flying over– next time! As I admired your beautiful work, I was thinking that a crow better not find it — they seem to attack all the nests around here. We do see crows occasionally, but not often. They seem to prefer the agricultural field down the road. We do see other predators though: Cooper’s hawk, Great Horned and Barred Owls for starters. 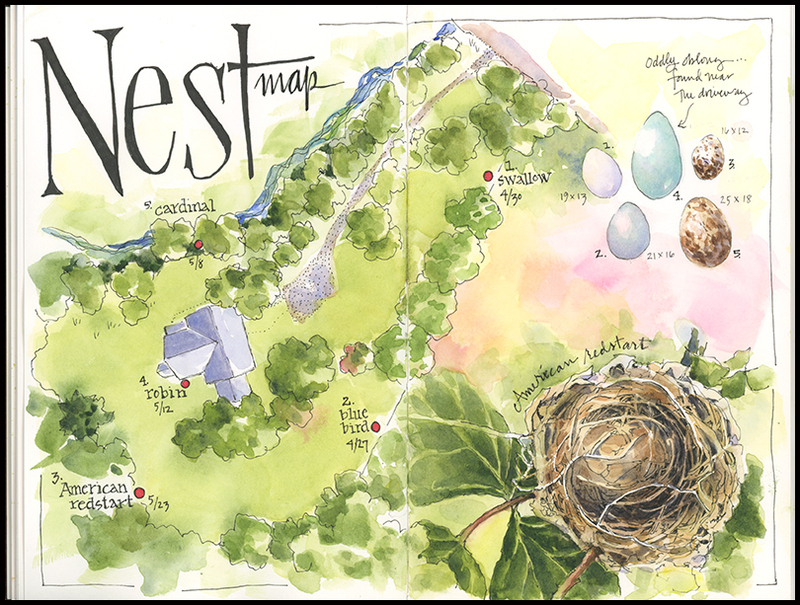 What a stunning idea to beautifully map the birds nests! I showed Nigel and we both love it! Beautiful. Always love your illustrations. Wish I could draw! Thank you! I’ve been drawing since I was a child, but like most things, drawing well takes practice, study, and affection. I’m sure you could draw if you decided to pursue it. Thanks Maureen. The map will be a good reference in future years to see if the same birds return to the same spots and to build out a picture of the birds on our property. Yes–it’s much harder without the bird for confirmation! I have no doubt that I will find other nests later in the year and those will be trickier to id. It’s incredible to be able to watch the nesting process from egg laying to feeding young to fledging. I’m glad it worked out well. I love making maps and combining them with other info. Thanks so much for your tips and techniques. It is so helpful to try to apply in my own journaling. Thank you! Glad they are helpful Julianne! I love getting ideas from other sketchers and have learned a lot from seeing how other people approach things. I loved this one Jean!! I want to do a map or two with you ! This is very appealing; I’m a map lover. 🙂 I like your mix of scale and use of the field guide for the eggs. A Redstart! Oh, lucky you, they are so beautiful. I do feel lucky about the redstart. I haven’t seen the male, but the female is an understated beauty. I just like knowing they are here, even if I don’t see them much. I am always inspired by your work, and the bird, egg, nest drawings are my favorites. Thanks so much for sharing your work! Thank you Rosanne. That’s so nice to hear. Nests, eggs, and birds are among my favorite subjects! What a nice note to wake up to! Thanks! And yes, I just updated the header last night and updated the paintings this morning. I was ready for a refresher. Have a good one!